I’ve been asked this question more than once: What’s the hardest thing about living in the tiny house? The hardest thing about living in a tiny house is answering that question. It’s hard for many reasons, but for everything I come up with, I find the positive side. I’m grateful for the difficulties because they keep us growing as individuals and as a family. It’s still life, really, so it’s hard for me to separate out what is the tiny house and what would be life in any other house. Certain things get easier, certain things get harder, as with any change in lifestyle. One of the hardest things about our lifestyle is keeping the house tidy with kids around–a small pile of shoes makes the entire house messy, but then the easiest thing is it only takes two seconds to clean it up! So really, when asked that question, it stumps me, because I don’t look for what’s hard, I look for what makes me feel alive. Living tiny makes me feel very alive, it forces me to find creative solutions to logistical challenges like: how can I get the space and solitude I need to commit to a daily writing practice? Get up earlier than everyone else. How can four stubborn, headstrong individuals navigate 168 ft. peacefully? Practice non-violent communication, breath deeply, play outside, create together, allow each other alone-time in the woods, let go of expectations. Some advice to those designing a tiny house: This week, I saw an online conversation among folks who are building and planning their own tiny houses and someone asked, “What about a range hood? Do we really need one in our space?” The comments leaned toward not needing one or a bathroom vent being good enough. I’d like to encourage anyone building a tiny or small house to give a lot of consideration to ventilation, especially if you plan to cook much in your tiny house. We went with a 36” range hood we found on Craigslist. It is larger than our stove. I recommend going with more range hood than less, because getting three to four burners going at once creates enough heat to raise the temperature in the house at least 10 degrees, and quick! This is great in winter, but in summer, turning on the hood while cooking helps keep the house from warming up so much, it also keeps the exhaust from stinking up the house. Many folks don’t cook much in their tiny houses, especially in urban environments, so think through your own lifestyle before heeding advice from anyone. There is a specific right answer for you and only you can find it. For me, I am super glad we have such a large range hood—it actually vents the entire house in a few minutes! Check out our ireport on CNN! Our friend and talented photographer, Audrey Brooke, the pictures for the story–we love them! This showed up on LifeEdited, and this on TinyHouseListings. It makes me smile to think that we are inspiring others to design their own American Dream. Thank you for this advice. I am very interested in building a tiny house for my daughter & I to live in (she is NOT excited) and every tip helps. You and your husband are doing the most amazing thing. We somehow make our lives complicated and they don’t need to be. Now you are free to enjoy your life as you wish. Your children will appreciate the time with both of you for all their lives. My best wishes to both of you! Thank you, Helene! I’m glad you stopped by. Best wishes to you!! My husband, young son and I lived in quite a few rigs on the road for many years. The largest was 224 sq ft., (32′ X 7′) an old schoolbus we created a home in. 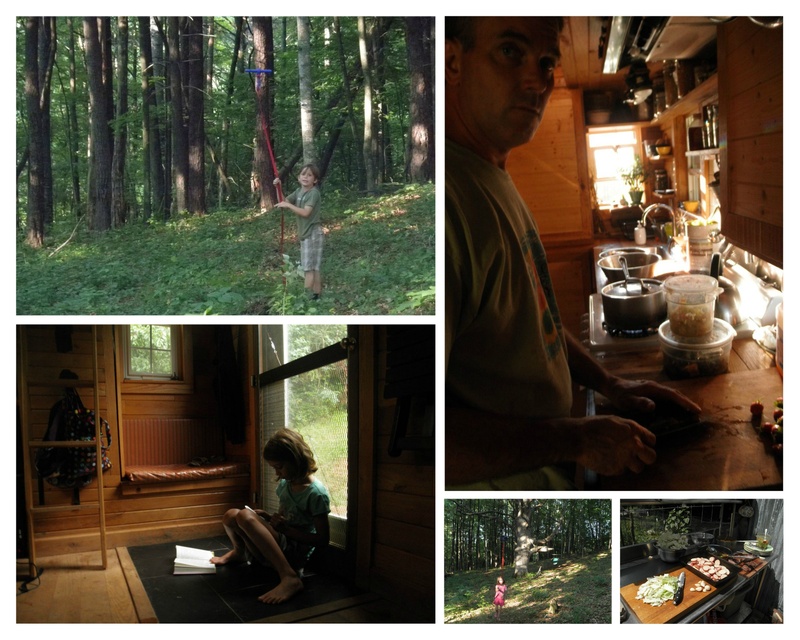 Later, our son made his own bus-home and we spent time in different places together. I miss those years. I was a crafter and all my equipment and subsequent crafts found places in the rig, as well as a small wood stove we used a lot. There is no reason that we can see for huge sprawling houses, even now that we are old. Everything you need is in your tiny home and the world outside is your front yard, wherever you are. Your story and pictures made me smile. Hooray for living a life traveling and making things. Sounds perfect to me. I am glad our story and pictures made you smile. That makes me smile. Thank you for reading and leaving your thoughtful comment! Best to you! Thank you for sharing a little of your life with us out here. One thing I noticed is how your family has allowed the out of doors to become part of your living space. That method of living has been used by families for the last 5000 years, you have discovered what others have lost freedom. By the way, compare your lifestyle to others in the world and you will discover you are living large in a beautiful home. Hi Dan, thank you for reading! Yes, including the outdoors, we have a large and glorious home. Best to you!!! Just curious, Do you have a TV or Internet or both? I also live in a small bedroom of a 2 bedroom apartment and have use of the Kitchen so I am living small in my opinion. Thanks. We have Internet through wifi hotspots on our cell phones. We have a TV for watching DVDs and VHS :). No “channels” as the kids say. It works for us! Thanks for visiting! You should let the kids build their own addition to the house! Kids are way more capable than we give them credit for. Your husband did fantastically on the interior, though– are there plans for that, or he just had the experience and pieced it together over time? I agree! The kids will definitely help build our bigger tiny house. We designed the basic floor plan for our house, and Karl is quite skilled, so we knew what we wanted, but a lot happened on the spot. We do plan on drawing up plans, since a lot of folks have asked about them. I am just starting to make plans for selling my house and downsizing. First I will live in an RV while I learn how to build my own house from materials I will salvage, which will teach me about deconstructing houses. Ever since I learned about the Small House Movement I’ve been learning everything I can about building my own house and different types of natural building methods, like cob houses. Your website is so inspiring. Thank you! Thanks for stopping by! I am glad you gather inspiration here. I like your plan! Go for it and best of luck! Be well. This was very helpful for me. Right now I am in college so I am used to living in dorm life, and I have always shared a room with at least 3 of my sisters. I also have 10 other siblings so space was always limited! :) I am trying to decide if I should do apartment living after graduation or try and do this, I really like the idea and I have land that I could use. Look forward to hearing from you. If you have land, then you have a big piece of the puzzle solved already! Look into the minimum size dwelling you are allowed to build on your land. If it’s possible to build tiny on a permanent foundation, consider doing that, unless there is a reason you’d want to be mobile. Good luck and it’s great to know that your generation is considering this lifestyle BEFORE you buy into the American debt system. Good for you! Graduating college in May, and I am looking into doing this I could really use some advice. Hello your web site has given me the confirmation that i could indeed live comfortably in a home that was formerly a vacation Cabin and is quite small. I have always been intrigued by the idea of living in small places and the economical use of space at least partly due to the due fact my Sister and her husband have lived in An RV and/or a one room home a good portion of their over 20 year Marriage.